The first edition of our #MailBBBox has landed. We received a steady stream of questions and have a range of boxing personalities to answer your queries. Following his recent loss to Lomachenko, where does Anthony Crolla go from here? Billy from Gateshead. I would say personally, he should retire, he’s done above and beyond probably everything in his career he could possibly dream of. Getting beat of [Youssef] Al Hamidi so early in his career then coming back to win a British title. To then get knocked out off Derry Mathews to win a world title and then have 2 unification fights. Then to box pound for pound for me number 1 out then. I don’t think anyone could of called that! He can hold his head up very high and be very proud of his career. Darren Reay, Pro boxer with a record of 4-0-1. 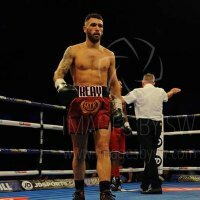 Darren boxes next on the MTK Newcastle show on May 3rd. If you base your game plan on the other guy gassing out then that could be a recipe for disaster. What happens when he doesn’t and is still going strong in the championship rounds? Sparring is essential for a boxers timing, range finding and practicing your ring craft based on the type/ style of opponent you’re up against. He’s up against it as he has to put on so many shows for TV. He fast tracks average fighters and that’s why he gets stick in my opinion. It’s worth mentioning as well that he has done a great amount to regenerate boxing in the UK. Steve Wraith, North East based boxing promoter and manager. How good is Lomachenko and who can challenge him? Jonny, Hull. Honestly, he is on another level. He is so good that NO-ONE beats him at lightweight for a very long time! He’s a special talent. ‘Smoking’ Joe Maphosa, undefeated Teesside Super-Flyweight contender. Yes looking forward to seeing Dave Allan (and Joe Cordina is always worth watching). Dave is not a house hold name but a good mate as I have promoted him at Rainton Meadows before. He is a top man and deserves a break. And that wraps up the first delivery of #MailBBBox! If you have any questions or thoughts you want to share on the current situation in boxing, hit us up on Facebook, Twitter, Instagram or email with #MailBBBox and we will put them to one of our many boxing personalities.